Roasted Asparagus with Lemon, Feta, and Pistachios-easy oven-roasted asparagus with lemon, feta cheese, and pistachios. 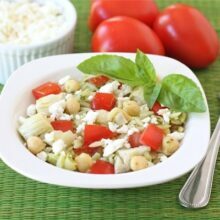 This simple spring side dish goes great with any meal. Happy St. Patrick’s Day! Do you have your green on? The boys slept in green pajamas last night because they didn’t want to wake up and get pinched…ha! They are prepared. I am eating all of my favorite green foods today, a green smoothie for breakfast, cucumber and avocado sandwich for lunch, and avocado mac and cheese for dinner. I am also going to make this Roasted Asparagus with Lemon, Feta, and Pistachios to go with our mac and cheese because why not? You can never have too many veggies and bring on the GREEN! When I saw this beautiful bunch of asparagus at Smith’s I HAD to have it. I think I like a beautiful bunch of asparagus as much as I like a beautiful bouquet of flowers. Asparagus screams spring to me and is one of my very favorite vegetables. I actually bought two bunches because it looked so good. I am going to make spring quinoa salad tomorrow. 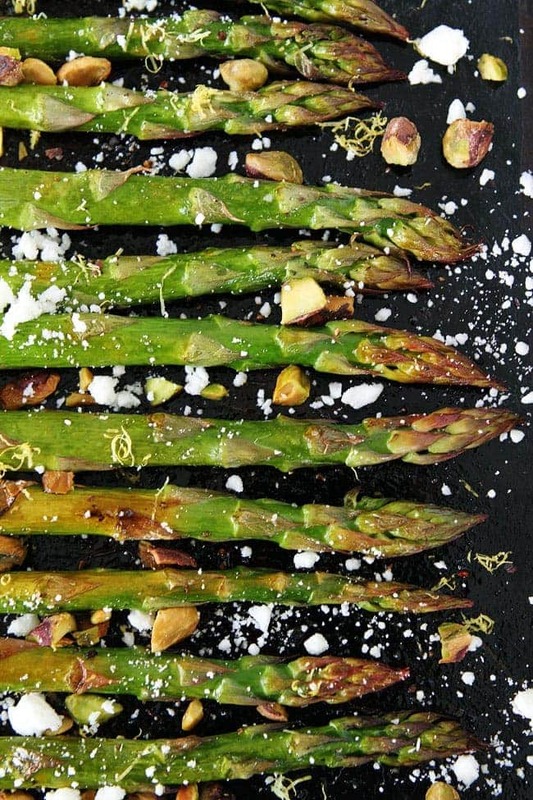 High five for asparagus season! You are going to want to pick up a few bunches of asparagus too because this Roasted Asparagus with Lemon, Feta, and Pistachios is fabulous. Roasting the asparagus brings out the best flavor and the addition of lemon, feta cheese, and pistachios makes it even better. 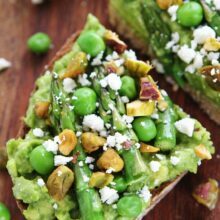 Burst of lemon, creamy feta cheese, crunchy pistachios on top of roasted, crisp asparagus…yeah, it’s a winner! Make it TODAY to celebrate St. Patrick’s Day…and make it all spring long because it is the perfect side dish for spring. I know it is going to be on our Easter menu this year! 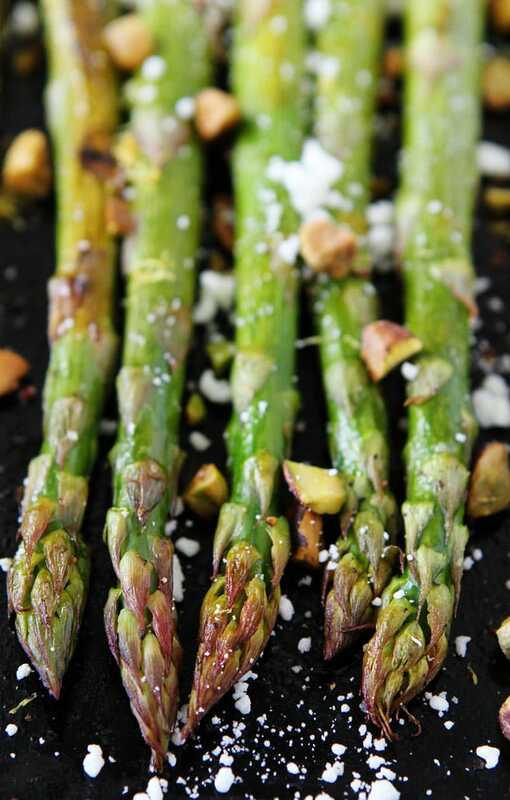 This easy roasted asparagus is the perfect side dish for spring and Easter. It goes great with any meal! Preheat the oven to 400 degrees F. Snap off the tough ends of the asparagus. The asparagus will break in the right place. Discard the ends. 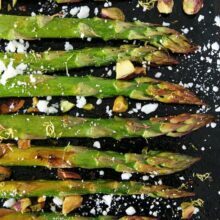 Place the asparagus spears on a large baking sheet. Drizzle with olive oil and fresh lemon juice. 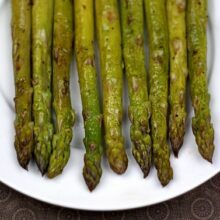 Toss asparagus until well coated and then arrange the asparagus spears in a single layer on the pan. Season with salt and pepper, to taste. Roast the asparagus for 12-17 minutes or until the asparagus is tender, but still crisp. The thickness of the spears will vary a little so check the asparagus at 12 minutes to be safe. I like my asparagus crispy so I usually leave it in longer. Remove the pan from the oven. 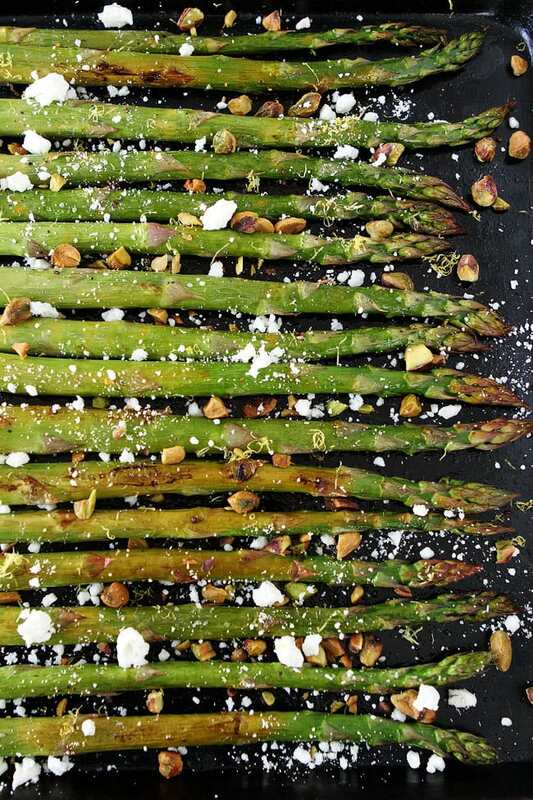 Top the asparagus with lemon zest, chopped pistachios, and crumbled feta cheese. Serve immediately. 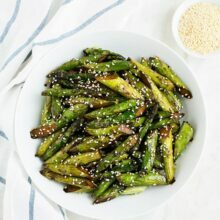 Asparagus is one of my favorite spring veggies! I had some this week too! 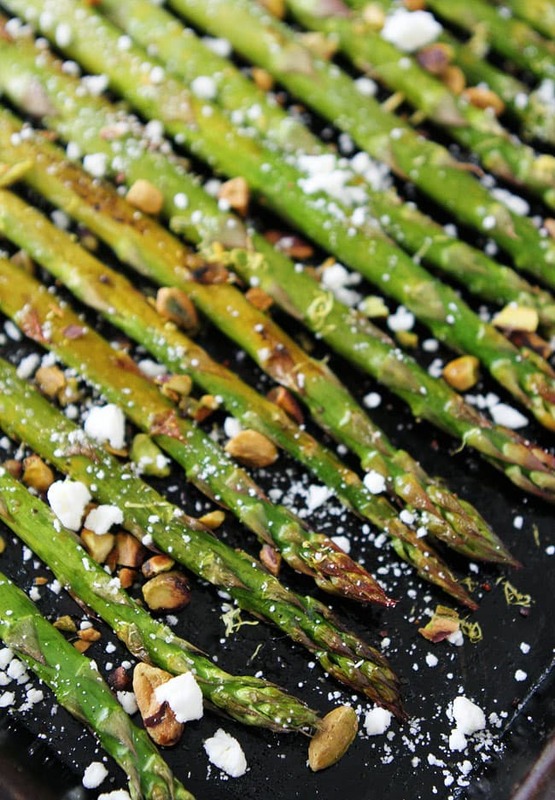 A great way to serve up asparagus this Spring! Such a nice way to enjoy asparagus! Two of my favourite green foods. My little girl loves to pinch my pistachios though, ha. Happy St Patricks Day!!! and these asparagus are gorgeous! Thanks for the recipe of asparagus. It seems easy to do and delicious to eat. It came as a surprise! This looks so good and I can’t wait to try it. Thanks for sharing! This looks amazing and I can’t wait to try it. Thanks for sharing! These were really good! We made them as a side dish for Easter Dinner. We had a small group but they were eaten! We will definitely make again and incorporate into weeknight meals. It was that easy. Thanks for sharing! This recipe is absolutely perfect for any summer bbq and the use of pistachios is to die for!! Oh. That flavor combo sound so good and so far from my normal boring steamed asparagus. I will have to try it! My husband made this as a side to chicken the other night. He left out the pistachios (I think he was too lazy to chop them HA!) but the combo of the feta and lemon was still SO amazing…the feta got a nice little crust to it from baking. So delicious. Will definitely be making again – WITH pistachios!